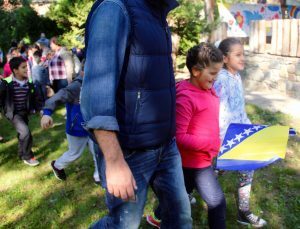 From September 16 to September 21 of 2016, the Center for Peacebuilding (CIM) in Sanski Most, Bosnia and Herzegovina, hosted its 7th International Peace Week. 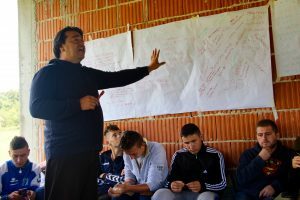 The Peace Week event, which was supported by the Auschwitz Institute for Peace and Reconciliation, brought international scholars and activists from the fields of human rights and peacebuilding to Sanski Most to join Bosnian youth for several days of work and instruction on the construction of peace. Dr. Tibi Galis, the Executive Director of the Auschwitz Institute, participated as one of the event’s Peace Ambassadors. The Center for Peacebuilding is a Bosnian NGO which seeks to rebuild trust and foster reconciliation among the people of Bosnia—Croats, Serbs, Bosniaks, and others—as well as support peace processes in other countries that have suffered from violent conflict. The Center acts as a bridge between a past that few can currently discuss and a future where open dialogue can rehumanize the enemy and dispel misinformation that acts as seeds for hatred. Through its International Peace Week, the Center for Peacebuilding looked to foster new connections among participants and work on the creation of a global network of peacebuilders. To this end, CIM was able to provide its scholars, activists, international guests, and local youth alike with opportunities to consider and discuss the state of contemporary peacebuilding, both in Bosnia and elsewhere in the world. 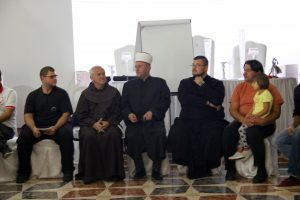 Throughout the event, participants were able to partake in peacebuilding lessons and were given the chance to attend an inter-religious dialogue that featured leaders from the three different religious communities of Sanski Most. Scholars and activists invited to the Peace Week conducted seminars on international peace building, genocide prevention and peace building through faith. For their part, the co-Directors and co-Founders of CIM, Vahidin Omanovic and Mevludin Rahmanovic, led seminars on the topic of identity. Overall, CIM’s 7th International Peace Week was highly successful, with all of the programming well attended and well received by participants. The lessons provided to attendees on peacebuilding, atrocity prevention, and identity equipped them with the necessary tools to function as peacebuilders in their own right and each departed from the event with a renewed sense of hope for a peaceful future in Bosnia.